During my urban photo walks I often set out to challenge myself with one camera one lens restriction. This time I focused on the ephemera in the heart of Glasgow, exploring coincidences or chance encounters in the area near St Enoch. 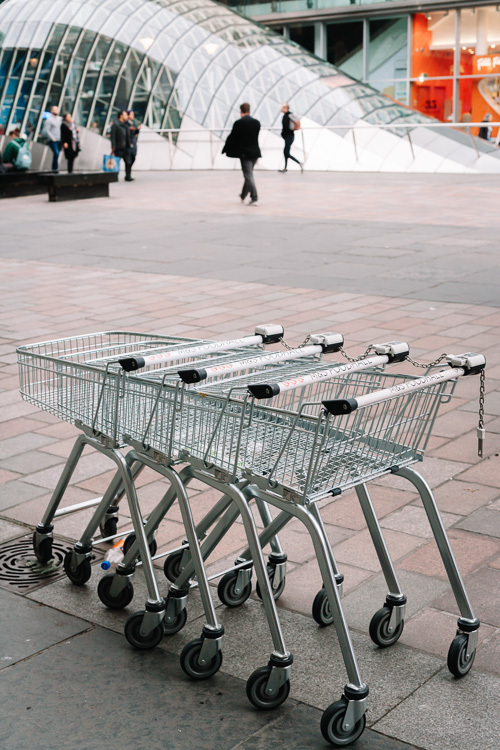 I noticed a set of interlinked shopping trolleys from the local M&S food hall and liked how the repeating lines made by the handles, feet and wheels evoked the carcass of the steel and glass canopy of St Enoch subway entrance in the background. 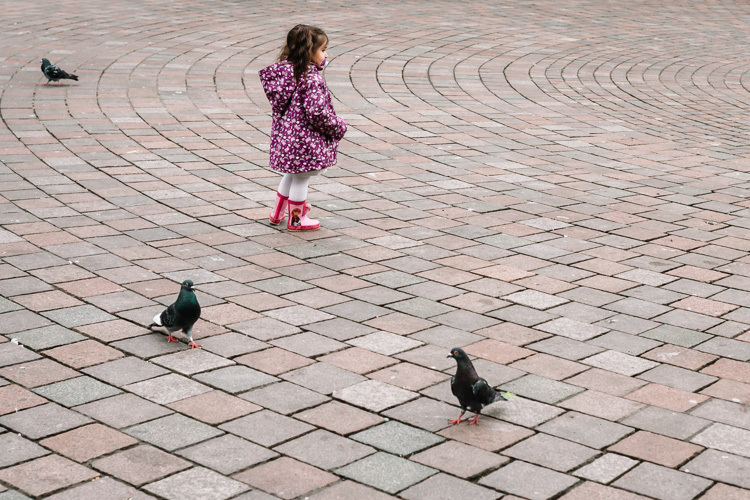 A tiny figure of the girl momentarily paused amid her play with pigeons on the concentric paved tiles of St Enoch Square, a formerly consecrated ground that lost its status when St Enoch’s Church was demolished. How random she and those pigeons felt on the uniform geometric stone pattern! 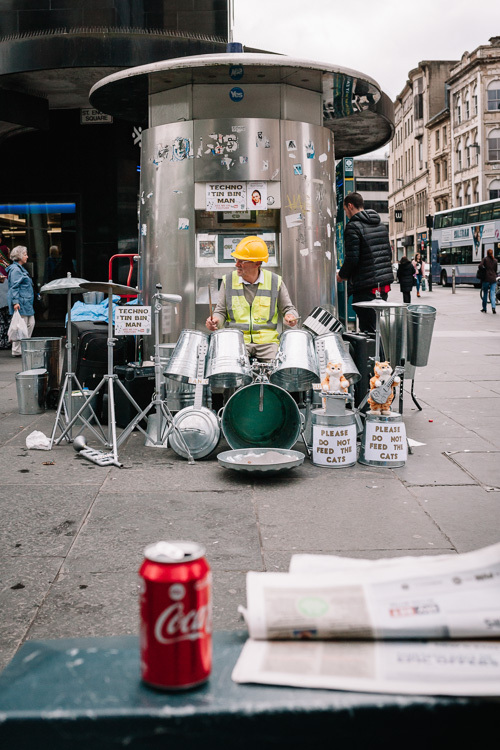 Outside St Enoch Centre I spotted the famous Glasgow busker Techno Tin Bin Man started his afternoon performance on his collection of bins sourced around the world. 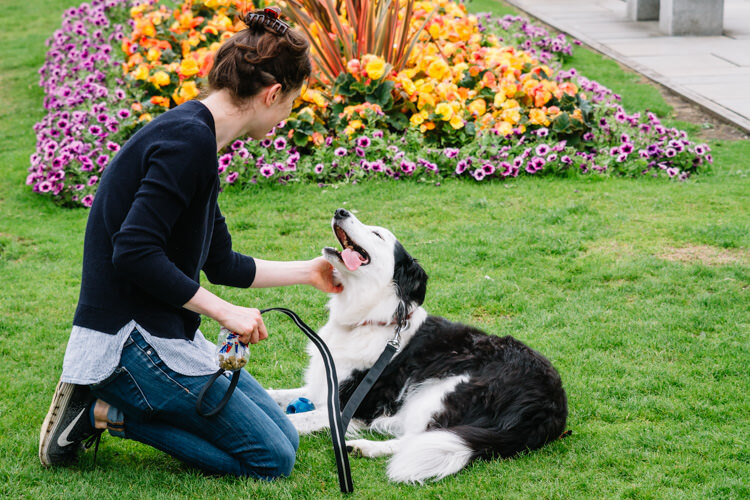 His signature hard hat and his helper duo of striped cats echoed the orange jacket of the passer by girl. I love there hustle and bustle atmosphere of St Enoch. 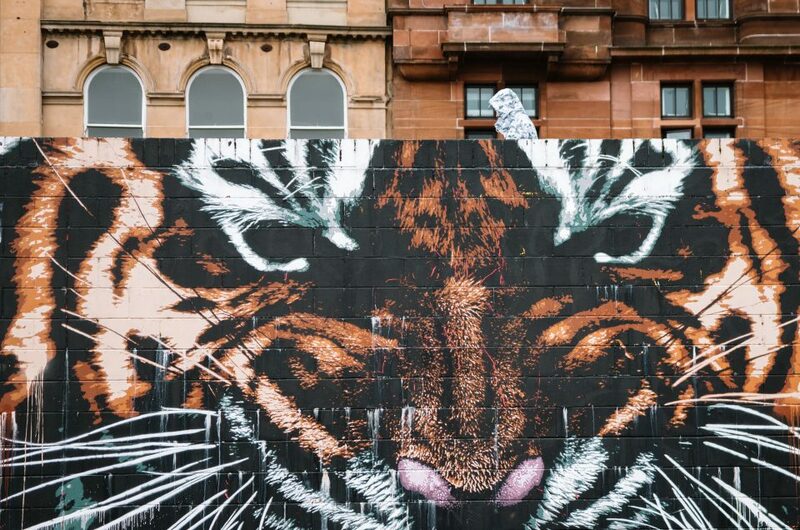 As it is located on the crossroads of Glasgow’s transport routes there are always people arriving and leaving. Rarely though one witnessed such an emotional (and synchronised!) 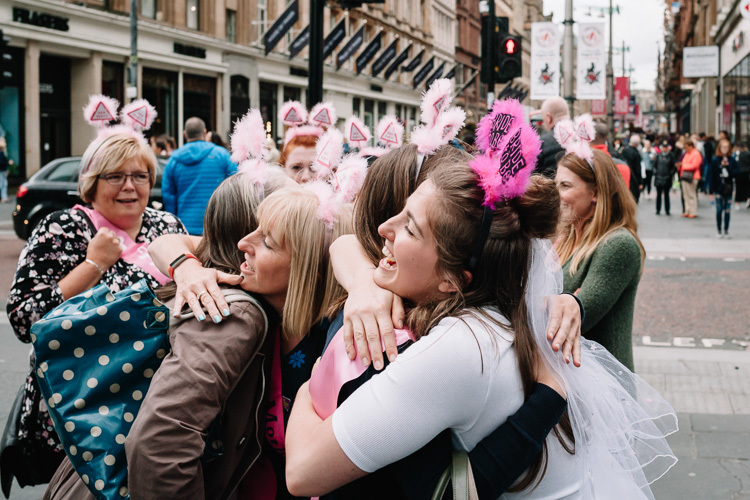 good-bye ritual as the one of the bride-to-be with her hen party I observed outside the subway entrance! 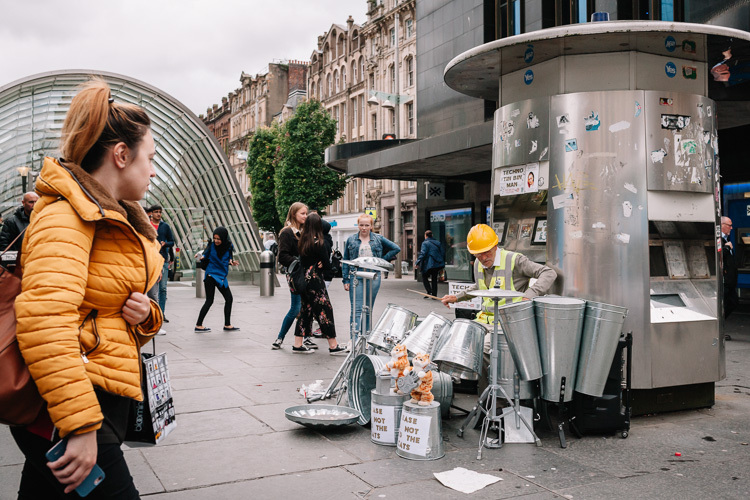 As the rush hour approached the unending line of walkers hurried along Argyle Street in both directions, one man suddenly stopping at the sight of Tin Bin Man opposite. 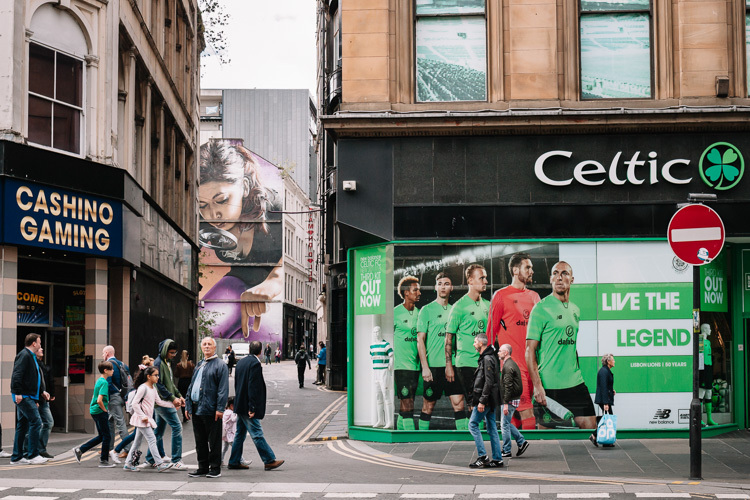 The people appeared tiny in comparison with the larger than life “legends” of Celtic, which was exactly the idea of Smug’s mural of the giant girl with the loupe visible in the distance. 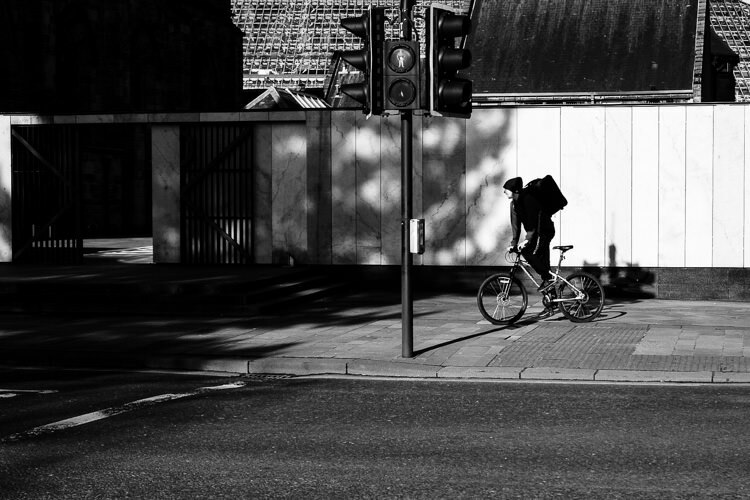 All street photos, apart from the first one (I started with the 50mm but it didn’t feel wide enough and I switched), were taken with the same 35mm lens.